This month's Food 'n Flix club pick is the 1995 Romantic-Comedy French Kiss, starring Meg Ryan and Kevin Kline. I'm hosting over at the Food 'n Flix site this month is you want to join in the fun! So, I chose this flick because it's one of my all-time faves. What can I say, I'm a cheeseball and a sucker for a good chick-flick. So basically, the film starts out in Canada, where Kate has applied for citizenship, so she can make a life with her fiance, Charlie. She's a fairly straight-laced history teacher with a fear of flying, germs, French people, and disorder. Charlie is urging Kate to accompany him on his business trip to Paris, but aside from her fear of flying, she reminds him that she's not supposed to leave the country until her citizenship comes through. Just before he leaves, the couple drive by Kate's dream home, and after Charlie asks how they can afford, Kate reveals that she's made the a nest egg. When he asks how many eggs, Kate says 45,782 eggs! After Charlie has been in Paris for several days, check-in calls coming later and later every day, Kate is in the kitchen with his sister when he calls and tells her that he's fallen in love, and that he's not coming home. Kate decides that she has to get on a plane and get Charlie back. On the plane, she is seated next to Luc, a surly Frenchman, who annoys her to no end, and winds up stashing something in her bag when she's not looking. Once she gets through customs, the high jinks ensue when the two are separated, and Luc has to track her down to get his stash back. If you know the formula of a chick flick, you will probably guess that Kate learns a lot about herself on her journey to win back Charlie. And, of course, she realizes that he isn't the right man for her...because the right man is Luc. The movie itself isn't heavy on food, but there is one scene that always makes me long to be on a train winding through the French countryside, smearing soft cheese on bread. Sigh. Oh, and when I'm talking about carrots, I always quote the line that Kate says nonchalantly, when she asks Juliette (the "goddess" that Charlie fell in love with) for "un carotte s'il vous plaît". There's a few other food scenes and a vineyard, plus FRANCE to pull inspiration from, though. 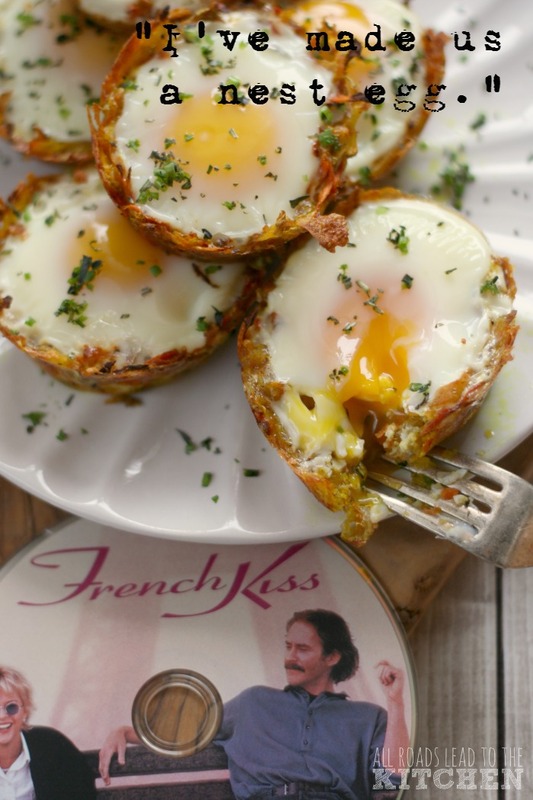 I decided to use a little play on words and use that important nest egg as the inspiration for my French Kiss contribution this month. Because, although not the one she expected, Kate does wind up using her 45,782 nest eggs to secure her future. And I included cheese and carrots in the nest, as a nod to my two beloved scenes. I am hosting this month's edition of Food 'n Flix over at the Food 'n Flix site. We are watching French Kiss this month, and submissions are due by the end of the day on January 29, if you want to join in! Join us next month as we head into the kitchen with our host Katharina of Pretty Cake Machine with her pick, Pan's Labyrinth. 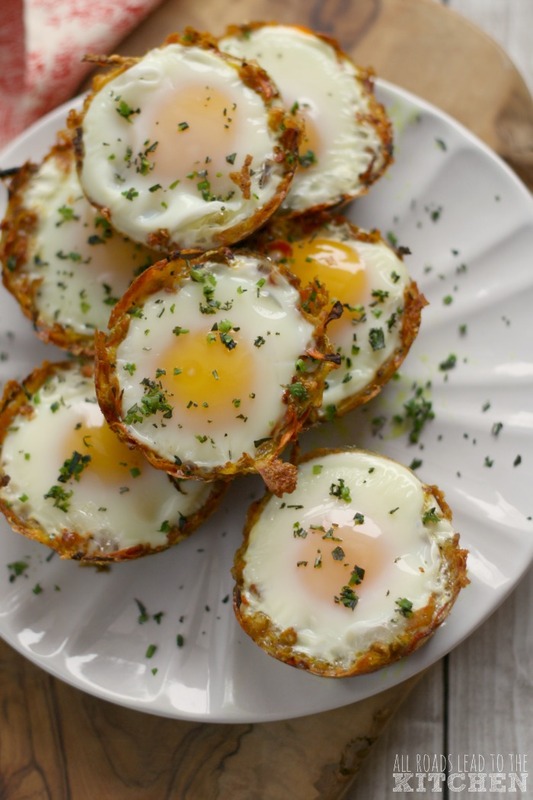 Eggs cooked in a nest of shredded potatoes and carrots. 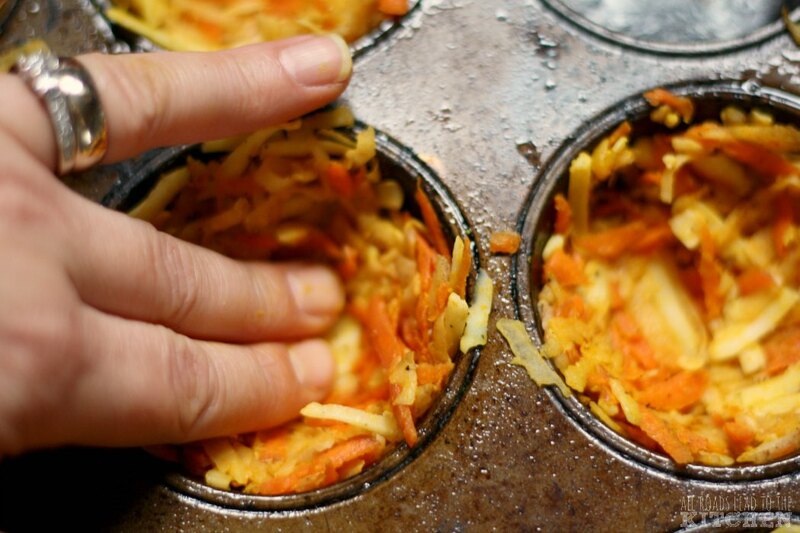 Preheat oven to 425° F. Grease (or use non-stick spray) on 8 wells of a regular-size muffin tin. Using the large holes of a box grater, grate the potato and carrots over your cutting board. Lay out a double layer of cheesecloth, or a clean, non-fuzzy kitchen towel (the carrots will stain the towel orange, so don't use a good one) and dump the shredded veggies into the center. Gather up the corners and sides and squeeze as much of the liquid out of the shredded veg as you can. Add the squeezed veggies to a large bowl. Shred the cheese with the large holes of the box grater, then add to the bowl along with the turmeric; season with salt and pepper; toss everything to combine. Divide the mixture evenly into the prepared muffin tin. Use your fingers to press into the bottom and sides, forming "nests". Really pack it in and let it stick out a bit, it will look like a lot, but it shrinks when it bakes. Slide into hot oven and bake until the edges have started to turn golden (cheese should be melted), ~13 minutes. 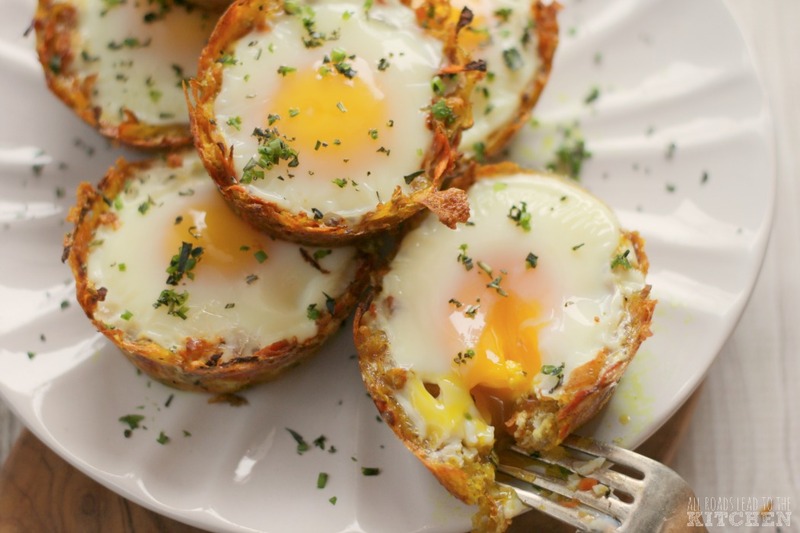 Remove from oven and lower heat to 350° F.
Carefully crack one egg into each of the nests. Slide back into the oven and bake until the whites are set, 14-16 minutes. Remove from the oven and allow it the "nest eggs" to cool slightly (so that you can handle them), then slide a thin-bladed knife along the outside of each nest and carefully slide a fork under to help you lift it out to your serving plate(s). Sprinkle with a smattering of fresh herbs and serve immediately. *I like to use garlic sea salt in a grinder, it adds an extra layer of flavor. ©All Roads Lead to the Kitchen. Inspired by and adapted from The Cooking Jar.